It’s the end of January and that means National Popcorn Day is upon us! The actual date is contested with some sources saying it’s the 19th (last Sunday) and others claiming it falls on Super Bowl Sunday. We’ve decided to compromise and celebrate right between these two dates. 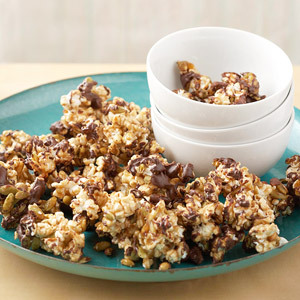 So whether you’re celebrating retroactively or preparing in advance for February 2nd, this Aztec Chocolate Caramel Popcorn is sure to please. Our results show that only a few thousand years [after its domestication] corn arrived in South America where its evolution into different varieties that are now common in the Andean region began,” Piperno said. “This evidence further indicates that in many areas corn arrived before pots did and that early experimentation with corn as a food was not dependent on the presence of pottery. So without pottery how did they pop the corn? Most likely they roasted the cobs directly over hot coals or flames. Nearly 5,000 years later, other ancient Peruvians would invent the world’s first popcorn popper, “a shallow vessel with a handle and a hole on top”. From being roasted on the cob around a prehistoric fire to being drowned in butter and munched on at the movie theater, popcorn has certainly come along way. The following recipe not only includes the popcorn loved by the Aztecs, it also incorporates another ancient food, Aztec chocolate. To learn more about ancient Mesoamerican chocolate read our blog post “Hot Chocolate: Gift of the Gods Since 1900 BCE.” So celebrate this National Popcorn Day with a recipe that reaches back to ancient times and enjoy the mix of past and present. 5. Sahagun, Bernardino de, Florentine Codex, 16th century CE. This entry was posted in Blog, Bon Appetit Wednesday, Culinary, Culture and tagged ancient history, AntiquityNOW, Aztecs, Bon Appetit Wednesday, chocolate, National Popcorn Day, Peru, popcorn, Superbowl. Bookmark the permalink.